The formation of a Deck Boys training school was the idea of Mr R.N. Greenwood who by his enthusiastic labours established the school and maintained it at a high level of efficiency until it's objective had been achieved. Shortly after WWII , when recruitment became necessary, the task was given to Captain P.J. Pycraft, a retired Master, who was given an office in a small shed in Vittoria Dock. Here he interviewed young lads and if they were acceptable they were sent to the *Outward Bound School at Aberdovey for training,(see footnote). This covered the requirements of the deck and stewards departments. Those lads qualified to do so, received financial assistance from the ‘Marine Society’, and the fees at Aberdovey were paid by the Company. It was just after WWII had ended that the ‘Merchant Navy Establishment’ came into existence, and it's operation placed considerable extra work on the Mr C. Cresswell and Marine Staff at Birkenhead. To introduce this new system of recruiting, Mr Lawrence Durning Holt seconded Mr R.N. Greenwood to the Marine Staff at Birkenhead to assist Mr C. Cresswell, who was already there. As time progressed and experience gained Mr Greenwood undertook the whole manning operation of Marine crews. After giving some considerable thought to the method of recruitment and training Mr Greenwood realised that Aberdovey was not giving the deck boys the type of training that they ought to have. In consequence when they joined their ships, they compared unfavorably with other lads who had been trained at the National Sea Training School run by the M.N.E. Aberdovey gave a very good character training course but often this had nothing to do with seamanship. It was at this stage that Captain W.T. Harris became involved. Mr Greenwood asked Captain Harris what he thought of the idea of having these lads given a practical training by a Bosun in a spare corner of the rigging loft. Captain Harris thought it was an excellent idea, and was invited to assist and then take charge. This he agreed to do. A small space was found on top of the rigger's messroom. A table and some benches were acquired, the area isolated by means of canvas screens and a modest start was made. The first Bosun instructor was Mr Mick Brabander. A syllabus was drawn up to cover a six week course. The work was all of a nautical nature, knots, splicing of rope and wire, parts of the ship, ship routine and watch keeping. Of course the syllabus could not remain static. With experience gained extra subjects were added. Every opportunity was taken to give the lads practical experience on board ships berthed in Vittoria Dock. During the Dockers meal hours, and without interference to cargo working, derricks would be raised, lowered and housed. It was also found possible to give the boys the opportunity to handle winches and mooring ropes. Small boat work under oars, sails and motor was undertake in the decommissioned lifeboats attached to the Lifeboat Training School at Vittoria Dock. In the meantime a new three storied fitting shop was under construction at Odyssey Works. A large class room and an office were allocated to the Deck Boy Training School. Mr Greenwood took a very active part in this construction ensuring that provision was made for the necessary anchorages for overhead bars and stays. 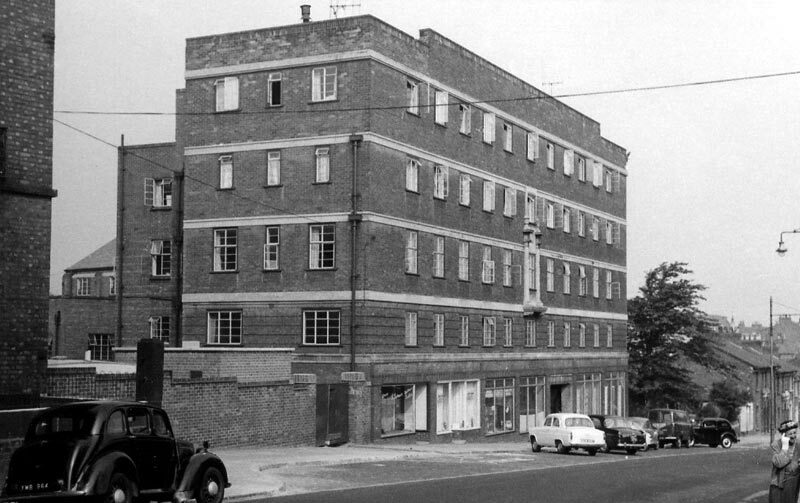 This new building was handed over in September 1958 and shortly afterwards the Training School took residence in their new quarters. Both Sir S. Mactier and Mr G.P. Holt took a great interest in the school although there was opposition from some quarters. Another man who took a great interest and whose help was invaluable was Mr R. Connor, Foreman Joiner. He had a number of large scale working models made in the joiners shop. These were extremely useful in practical demonstrations, and in constant use by the lads as they learnt the workings of a ship. Slowly but steadily the school began to take the form they had been striving for, and soon it became the envy of visitors from other training schools who came to see the new school. Mr Frost the representative of ‘British Ropes’ was a frequent visitor. He was a retired Naval Officer and through his good offices ‘British Ropes’ were persuaded to make a presentation of a leather pouch containing a sheath knife, fid, marlin spike, sewing palm and needles. This was presented to the best boy in each course and was eagerly sought after. If possible, someone of note would make the presentation and on several occasions Mr G,P. Holt did so. Mr Greenwood did all the recruiting and interviewing. Suitable lads were then sent to the school to undergo a simple test in writing and arithmetic. Lads who lived out of town were accommodated at the Birkenhead Y.M.C.A., Whetstone Lane, at the Company's expense. The Y.M.C.A was also being used by qualified Blue Funnel seamen waiting to join their ships, and by those attending Board of Trade courses at Odyssey Works and Vittoria Dock. The Deck Boy trainees were also supplied with pocket money, a beret and a jersey with the company's name on it. All the training staff were anti long hair and insisted on a reasonable hair cut but at times it seemed they were fighting a losing battle. A new officer instructor in the person of Captain K. Eder, who was unable to pursue his career at sea, was appointed to the school. Captain Eder got on well with the boys and his easy manner got the very best from them. For carrying out the practical work Mr D. O'Brien, Bosun, replaced Mr Brabander, who returned to sea. The training was also assisted by a succession of sea-going Bosun’s whilst they were ashore awaiting ships. This was an excellent plan as it allowed the Bosun’s to see how the school was preparing the lads and also the Bosun’s brought in fresh ideas to the school and kept the training staff in touch with the latest developments on board ship. With the arrival of Captain Eder, Mr Greenwood suggested that both Captains should try to get some sort of professional teaching qualification. At this suggestion, Captains Harris and Eder attended a two year evening class course at Mount Street and obtained the L & C Guilds certificate in Technical Teaching. When the Stewards training school became established, the Stewards were given tuition in boat handling and they also joined the Deck Boys in their visits to Guinea Gap Baths. For recruitment purposes, Mr Greenwood undertook a number of tours which covered the whole of the U.K. Isle of Man, N. Ireland. As time afforded he gave talks to Sea Cadets, Sea scouts, Schools, youth clubs etc, which yielded many fresh recruits. With the passing of time more ship models were added. A ‘mock-up’ wheelhouse incorporating a moving scenic seascape was built, giving quite realistic practice in receiving and putting into operation steering orders. Another model was a scale-size working lifeboat fitted to gravity davits. The deck on which this lifeboat was fitted could be inclined to show the use of ‘bowsing tackles’ and ‘tricing pendants’ to cope with adverse listing when lowering the lifeboats. A shipbuilders scale model in a glass case was used for identifying parts of the ship and standing rigging. With the advent of container ships the demand for trainees decreased rapidly and the school was finally closed at the end of 1972. Unfortunately all the records of the school have been lost, and cannot be traced. During the battle of the Atlantic in WW11, merchant seamen were forced to take to the lifeboats when their ships were sunk. It became very apparent that the younger sailors, who were presumed to be the fitter, were not surviving as well as the older men in the open lifeboats. Lawrence Durning Holt sought help from his friend #Dr Kurt Hahn, who figured that the younger sailors did not have enough experiences of life. What’s more, the older sailors had been brought up in an age of sail, had learnt lots of practical skills, and dealt with difficult situations, thus giving them more confidence and ability to cope with demanding challenges. In 1941 Lawrence Durning Holt and Dr Kurt Hahn started the very first ‘Outward Bound’ School at Aberdyfi. The school was designed to toughen the sailors and teach them survival, and more importantly- ‘the will to live’. Each course lasted 26 days. #Dr Kurt Hahn was the founder of Gordonstoun Boarding School in Scotland, and it was here, in 1934 that he started a scheme known as the County Badge Scheme. In 1956 this changed its title, and become known as the The Duke of Edinburgh Award scheme. ‘Outward Bound’ means – When a ship is sailing from her home port to her last and furthermost port, before turning around and heading for home, when she’s then ‘Homeward Bound’. Lawrence Durning Holt chose this name for the course. Today there are over 50 ‘Outward Bound Schools’ in more than 28 countries. Thanks to Mr Gwyn Jones (Blue Funnel 1961 ~ 1971) for sending us this very interesting article. Birkenhead Y.M.C.A. photograph also from Gwyn.